The bicycle is a piece of modern art. As a piece of design it’s unrivalled in the 20th Century for its purity of form. Lance Armstrong has been riding a who bunch of beautifully decalled bikes through his comeback season. 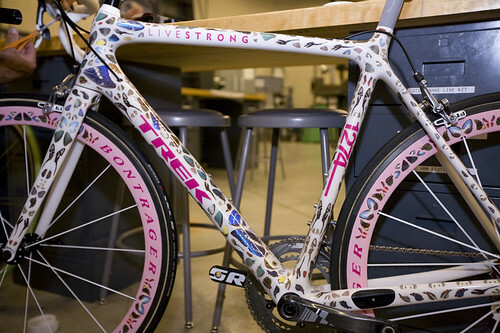 Putting aside all other sentiments, the Damien Hirst decorated one is among the most beautiful pieces of bike art I have ever seen. KAWS – STAGES PORTRAITS BY LA MJC from La MJC on Vimeo. At the occasion of Stages art show opening in Paris, La MJC had the chance to interview most of the artists. I’m in Paris this weekend and really want to go and check out the Stages Exhibition at Galerie Emmanuel Perrotin which runs until 8 August 2009. I’ll try and remember my camera and grab some pictures. This entry was posted in Bikes, Tour de France and tagged "Galerie Emmanuel Perrotin", Damien Hirst, Lance Armstrong, Madone, Paris, Stages, Trek. Bookmark the permalink.